For builder members of the construction industry engaged in construction of custom new homes, it is critical that agreements with owners be formulated to address two major considerations. First, agreements should be written in concise and simple language so as not to be intimidating, which may dissuade owners from retaining the contractor. However, the builder will want to have an agreement that addresses the essential legal rights of the parties. Such a contract will have the objective of avoiding misunderstandings, disputes and costly litigation. In my experience, when conflict between builders and owners does occur it is frequently as a result of a contract which does not clearly deal with common situations which may be encountered during a project. A frequent source of conflict also occurs because of amendments to the scope of work, design or specifications and materials. These should all be discussed, agreed to, reduced to writing and signed by the builder and owner. Otherwise, there is a risk of misunderstandings between the parties, leading to disputes. I have been involved on numerous occasions when an owner has refused to pay the builder on the basis of misunderstandings concerning these matters and the amount due. If the contract is not sufficiently clear in these respects, the builder may be forced to suit to enforce payment, resulting in costly litigation. In the end a court may have to pick and choose amongst conflicting evidence resulting in a judgment which neither party will be satisfied with. The moral of this is to start with a contract which is both clear and complete, keep changes to a minimum and require all amendments to be in writing, signed by both the builder and owner. In this section the parties identify the plans and documents that form specifications of the work (for example: drawings, plans and specifications or details). In this section there is a description of the work. For example, is the builder responsible for all aspects of the construction and finishes and if so the specifications, or are there aspects that the owner will have responsibility for? For the sake of clarity and to avoid disputes in the event of uncertainty, describe what is beyond the scope or not included in the work. In this section the agreement deals with the rights of the parties in the event that circumstances are encountered that were not initially anticipated. If these circumstances increase the amount of work, materials and/or time required, the agreement should state that these are extras to the contract price together with an extension of the date for completion. For example, encountering adverse soil conditions that complicate excavation and/or foundation works. The basis for calculating the additional charges should be indicated (ie. builder’s cost plus 10%, a lump sum or etc.). A thorough agreement should indicate what warranties are being offered by the builder and their limitations. In this respect it’s important to consider whether the Tarion warranty applies and if so, the rights and obligations of the parities as a consequence. Basically, Tarion’s warranty applies to so-called “contract homes,” which are built by a contractor who undertakes the performance of all work and supply of all materials. Tarion’s warranty does not apply in respect to “owner-built homes.” Essentially, this would include situations where the owner exercises significant control over construction of the home or responsibility for contributing one or more essential elements or if separate contractors build different stages of the home. The agreement should be clear about the total price being charged for the work. Additionally, it will specify whether the price is payable in a lump sum or in installments or draws. In any event, the contract will indicate the timing when payment is due (payment schedule). The dates for starting and completing the work will be set out. The responsibility of the owner and builder to obtain governmental approvals and permits required to authorize the work such as: zoning variances, demolition, building and other permits. If the project requires special utilities to facilitate the work, the agreement will specify whose responsibility it is to provide them, such as electrical, water, sanitary and waste removal. In the event that the builder is performing work in addition to other contractors retained directly by the owner, the agreement will specify who is responsible for coordinating the work of the contractors and the additional amount payable in this respect. In the event of a dispute between the parties, the agreement will indicate the procedure for resolution of different types of disagreements. For example, should the parties attempt mediation and/or arbitration prior to resorting to the courts? This will be influenced by whether Tarion warranty coverage applies to the agreement. If Tarion applies, the contract is deemed to contain an agreement to submit differences between a vendor and owner to arbitration. 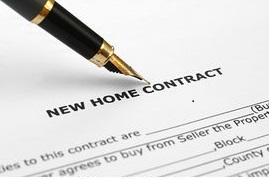 The foregoing are some important aspects of agreements relating to custom new-home construction that should be covered by written contracts. Please consult a lawyer for advice about your individual situation. This article and its information are not legal advice, nor are they intended to be. Frank Feldman, B.A., LL.B, is a barrister & solicitor with Feldman Law. This entry was tagged construction, contract, custom, new home. Bookmark the permalink.